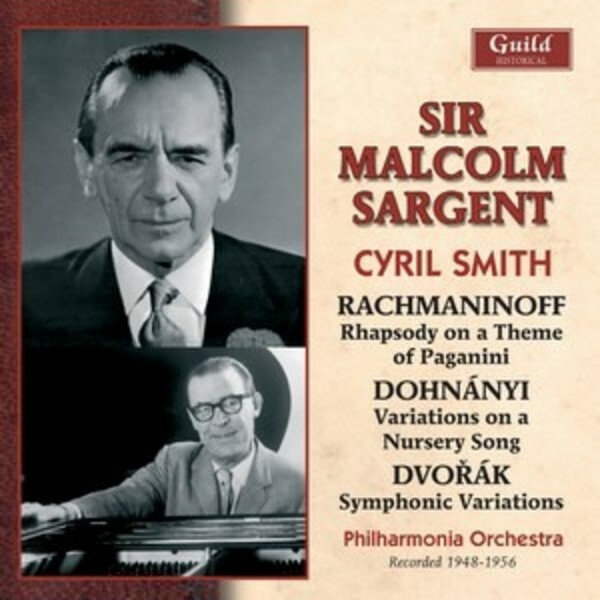 Recent issues of recordings by Sir Malcolm Sargent (1895-1967) on the Guild label have been greeted with considerable critical acclaim - in particular an all-Rachmaninoff CD (GHCD 2423) which featured the Second Concerto played by Cyril Smith. Here, on this new CD, is surely the greatest performance of Rachmaninov's Rhapsody on a theme of Paganini next to the composer's own. And it is coupled with an equally dazzling account of Dohnanyi's evergreen Cyril Smith - in both works, Smith showing himself to have been one of the greatest British pianists ever. The disc is completed with a wonderful performance of Dvorak's Symphonic Variations, also with Sargent and the Philharmonia - in excellent stereo.